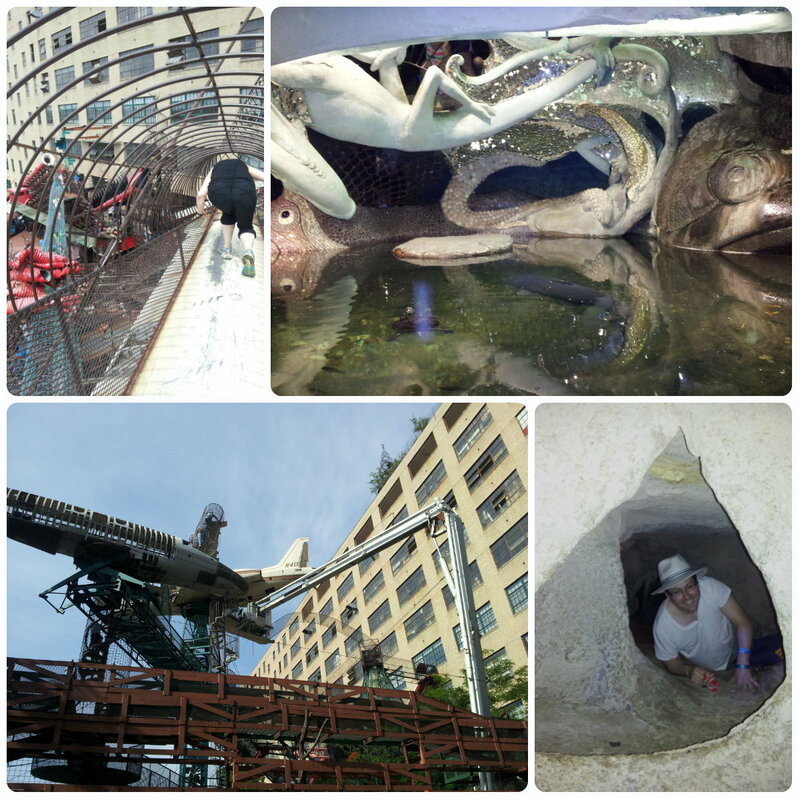 I just wanted to tell you about the best place on earth: City Museum in St Louis, USA. This was the place that started the whole Art Playground idea. I don’t intend to try and recreate it- it definitely stands alone- but it gave me the inspiration for a place where rather than “don’t touch” and “be quiet” the signs say things like “please climb on the artwork”. We spent nearly 6 hours climbing around in the 10 story ex-shoe factory, created by artist Bob Cassilly. They describe it as “an eclectic mixture of children’s playground, funhouse, surrealistic pavilion, and architectural marvel made out of unique, found objects.” It’s called City Museum because almost everything in it comes from within the city of St Louis, including the two aeroplane fuselages and the school bus on the roof! The photo of Jamie in his hat below was taken just as the organist started playing the theme to Indiana Jones on the huge tarnished church organ that sat halfway up the wall of the factory. Surreal and brilliant. Every time I go to a museum or stately home, I always seem to be most interested by the doors and staircases that have “no entry” signs across them and I tend to want to explore or climb on exhibits at exhibitions in a way which isn’t usually encouraged! City Museum is the antidote to that. 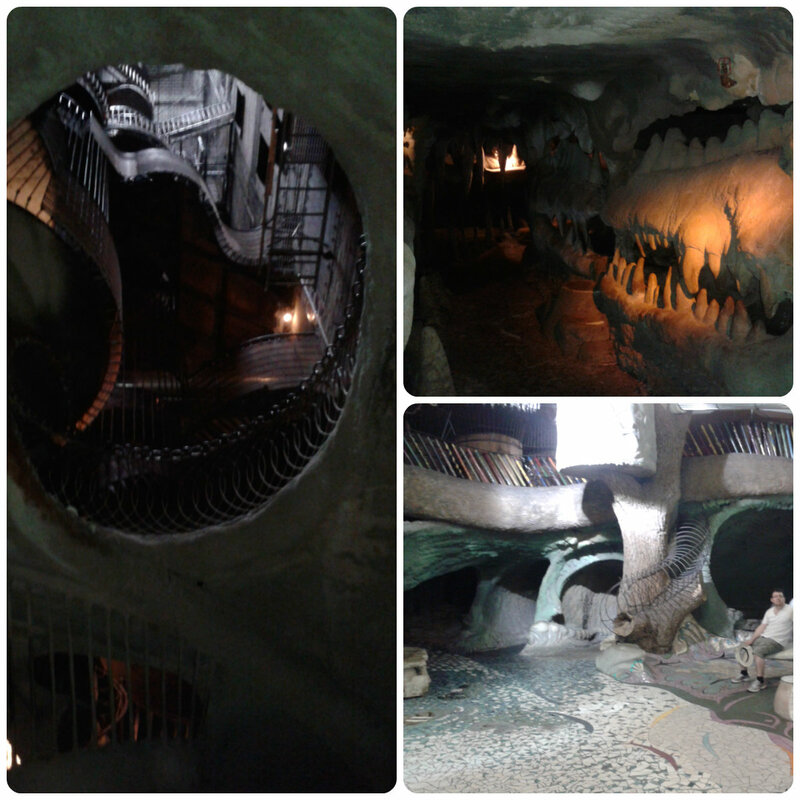 As we walked in I saw a hole in the ground, a tunnel, and thought “I wonder what’s down there?” and then I had an amazing moment of realisation, like Christmas day; because it was the City Museum I could just jump in and see where it led. So I did. Many hours later we made our way back to the entrance. I was tired from crawling and climbing, covered in grime and bumps and scrapes and the happiest I have ever been. If I can give someone even a quarter of that experience through Art Playground, it will be worth it.